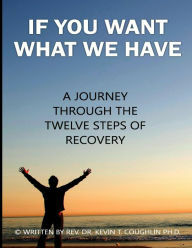 You are here: Home / Non-fiction / If You Want What We Have: A Journey Through the Twelve Steps of Recovery by Author – Rev. Dr. Kevin T. Coughlin Ph.D. There is so much wrong information about addiction recovery, and false information about the 12-steps and the different fellowships and programs; the truth is that these programs work and that they save lives! I felt it was my obligation to share what I have learned over the past 47 years about addiction recovery and the twelve-step process. I originally got clean and sober at a twelve-step retreat that was started by one of the Founders of Alcoholics Anonymous, Bill W., it was at this retreat that I started to realize that I had a calling on my life to help other sick and suffering alcoholics and substance abusers. After two decades of teaching on addiction recovery and the twelve-step process, and developing my skills as a professional writer, it only made sense to combine the two and share this life-saving information with a larger audience. That is what this book does. It is a workbook and guide to help those using a 12-Step Program and Principles get the most out of their recovery work. By seeing thousands of lives transformed by The 12-Step Program of AA and NA. I originally got clean and sober at a twelve-step retreat that was started by one of the Founders of Alcoholics Anonymous, Bill W., it was at this retreat that I started to realize that I had a calling on my life to help other sick and suffering alcoholics and substance abusers. So I began writing and publishing recovery books to help others who are looking to reclaim their lives back from any type of addiction.